Dr. Bill Hardgrave, Dean and Wells Fargo professor in Auburn University’s College of Business, spoke to the club on matters involving the college and observations since joining the college as dean in August 2010. He shared with the club data on academic enrollment, technology integration and emerging degree programs like the soon-to-come business analytics program. 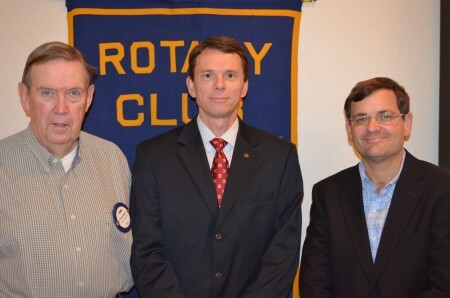 Pictured with Hardgrave is program host and retired Business professor Ford Laumer (left) and club president David Reaves (right).